The development of the organic market was rapid in 2011 and 2012 after lagging behind the rest of Western Europe. The market grew by 41% in 2011 and it continued to grow in 2012 at the double-digit pace. However in 2013-14 the growth stopped to single-digit values (2% growth in 2013). The over-all market share of organic food in Finland is less than 2% and the market size was 220 M€ in 2013. Growth was fastest in fruit and vegetables in 2013. The market share varies greatly between product categories. The highest market shares are in eggs and vegetable oils. Market shares which are over 3% have been reached in root vegetables, tea, fresh milk, flour, flakes, ketchup and soya sauces. If calculated value based the most important organic product in retail is fresh milk. The growth drivers are more positive attitudes and higher awareness of consumers to organic food at the same time as also local food is gaining in popularity and consumers are becoming more critical of the industrialized farming and food system. Importantly both big supermarket retailers, the S-Group and the Kesko-Group have now joined the band-wagon and are developing their organic range and participating in cooperation to develop the Finnish organic sector. The Pro-Luomu association (Pro-Organics) which was founded in 2011 has started active promotion and development work of the organic sector. 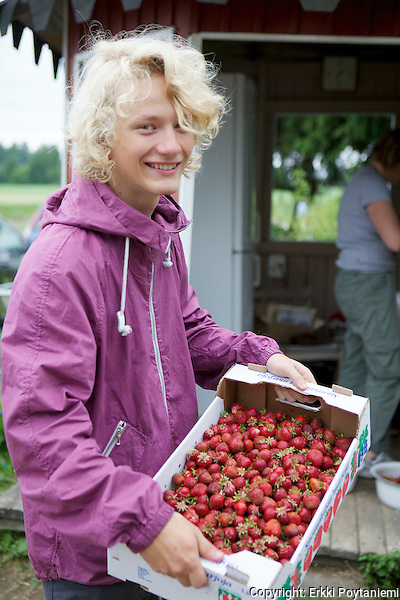 The number of certified organic farmers in Finland is approximately 4300 (2014: 1% increase compared to 2013). During the last 5 years the number of organic farmers has increased by -1% to 6% per year. 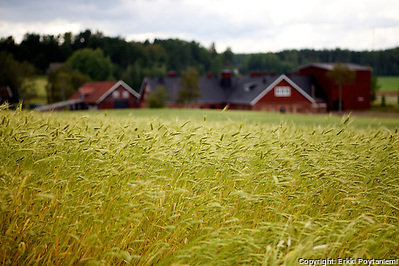 8% of Finnish farms are organic. In 2014 9,5% or 215.714 hectares of Finnish field area was certified organic (of which 22.662 ha in transition). The growth rate compared to the previous year was 5%. The average size of an organic farm has increased by over 1-2 ha per year and was 50,9 ha in 2014 (Evira). Organic farms are in average over 10% bigger than conventional farms. Also organic farmers are younger than average even though exact statistics of this are not available. Even though organic farming areas are growing, the demand is growing faster. This can be seen in the grain market where the oversupply situation that was typical to the Finnish market for years and led to export of organic grain is over. Now organic rye, barley and even wheat are imported and oats is the only grain with a surplus. This is a result of increased use of organic grain in the food industry but even more importantly the growth of organic animal production leads to increased demand of organic fodder. 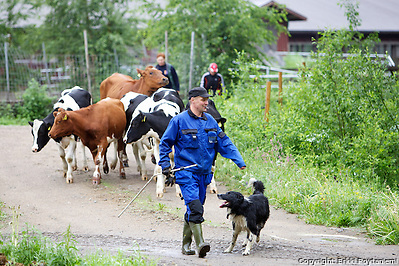 As in conventional farms in Finland most of the acreage on organic farms is used for fodder production. 40% of the acreage is grass which is usually dominated by red clover. Roughly one third of the acreage is grain and pulses. 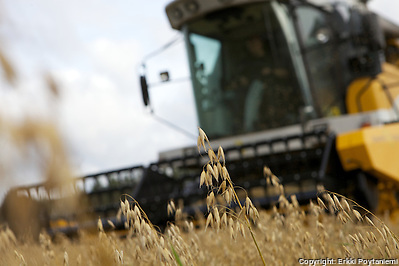 Half of the organic grain acreage and production is oats while in conventional farming barley is the most common grain in Finland. In 2013 Finland produced 90,5 million kg of organic grain from 42700 hectares. This represented 2,2% of the Finnish grain production. Organic oats are exported in large scale by Finnish mills as oat flakes and other milled oat products. It was estimated that 60% of organic grain is exported in the form of milled products and bakery products. For organic oats the figure could be as high as 80% (Proluomu). Finland produces also organic vegetables and potatoes but apart from potatoes is far from self-sufficient. The largest acreage is in potatoes, carrots, onion and cabbage. Also strawberries, black currant and apples are produced. A large part of the potatoes are for starch, most of which is exported. The number of organic animal farms has steadily increased since 2005. In 2013 organic animals were kept on 814 farms – an icrease of 7% since 2012. The most common production forms are sucking cow, dairy cattle and sheep. The number of farms producing organic pork (13 farms in 2013) and eggs (34 farms in 2013) is low. Only one farm is producing organic “broiler” chicken meat. Even though 40% of certified organic farms are animal farms only about one third of those have certified their animal production. Therefore a significant number of organic farms do not bring any organic products to market. The organic grain and fodder produced on those farms is fed to animals on the farm and the animal products – typically meat and milk – are sold as conventional products. The certified organic wild harvested area in Finland is the largest in the world at 9 million hectares. Most of this area is in Lapland. An area can be certified as organic picking area if chemical fertilisers or pesticides have not been used for the previous 3 years. This is easily true in most forests in Finland. The challenge of certification is more about documentation and therefore forests in Southern Finland where forest ownership is more fragmented are seldom certified. The main products from organic wild harvest are blueberry and lingonberry. According to certification statistics there were 450 certified operators processing or importing organic food in Finland in 2009. If small-scale processing on farms is deducted there remains approximately 250 operators. Only 10 of these have an organic turnover in excess of 10 M€ and almost all are mainstream operators for which organic is a minor part of their overall business. With the positive market development more food manufacturers are entering the organic market now. Most of the organic products (84%) are sold in mainstream retail channels. Big hypermarkets have a range of up to 3000 organic products of which approximately 60% are domestic. This leaves 16% to other types of outlets: speciality stores, open markets, direct sales etc. While this is a small part of the total sales it is proportionately far bigger than in food sales overall. The importance of organics in the Finnish catering sector is increasing. 16% of catering operators used some organic products in 2009. The share was 28% in restaurants and 13% in the public sector. However only 0,6% of the sales of catering wholesalers is organic while organic represents 5% of food served in public catering (Proluomu). Catering is not within the scope of the EU organic regulation and Finland has not implemented a certification system for organics in the catering sector. Ekocentria has developed the “Steps to Organic” (Portaat Luomuun) program as a voluntary program aimed at helping professional kitchens increase their use of organic products as part of sustainable development. In 2014 2428 kitchens had joined the program. The first step is defined as “At least one (1) significant raw material as an organic product in permanent use in the kitchen. Other organic products in use where practicable.” The 6th “Star”-level means that everything that is available should be organic and organic should be 85-100% of the offer. Organic product exports in 2009 were estimated to be 14 M€. This represents 1% of Finnish food exports. 40 companies are exporting organic products from Finland – some of them already for several years. The most important Finnish export products originate from the grain sector: oats and oat flakes, wheat flour and bread. Finland is especially strong in organic oats but also Finnish spring wheat and rye are known for their high quality. With more limited possibilities to export grain-based products in 2011 and onwards it is estimated that organic exports have declined possibly to less than 10 M€ value. Other organic export products include potato starch, wild berries, dairy products and meat. There are no statistics on organic imports but we estimate that the share of imported products on the Finnish organic market was roughly 30% (2008) representing a retail value of 22 M€. This includes raw-material imports and products imported as ready retail packed products. The figure does not include alcoholic beverages. With the fast growth of the organic market in 2011-12 the share of imported products could have increased but no statistics are available. This text was originally written as the Abstract of the “Organic Industry Report 2010” (Luomun toimialaraportti 2010) published by Organic Food Finland in 2010. The text has been updated by Erkki Pöytäniemi in November 2012 and December 2014. The Organic Industry Report is available for download in Finnish here (Link). Certification statistics are available from Evira. My name is Rafael Losilla, manager magazine F&H -Frutas y Hortalizas-. We are making a report about the consumption organic fresh fruits and vegetable in EU. I have seen your website and we would like to know if there are informations about the consumption organic fresh fruit and vegetable and information about channels and distribution. I look forward to hearing from yours. The main organisation that has this kind of market information in Finland is Pro Luomu (Pro Organics). Check their web-site at http://www.proluomu.fi – you will find something also in English. Hello, Erkki. My husband and I have just moved to Finland. We are looking for a source of Bragg’s Raw Organic Apple Cider Vinegar. Do you know where we can buy it, or another raw ACV that is available in Finland, either in shops or to purchase online? Thanks! I think you could try Ruohonjuuri.